A gorgeous Southern Exposure second-floor coach home with 3 spacious bedrooms, den, 2.5 bathrooms, and 2 car garage. Extensive Architectural detail throughout includes coffered ceilings, crown molding, wall niches, tile on diagonal in living areas, wood flooring in den, 42" wood cabinets, upgraded granite countertops, designer tile backsplash and stainless steel appliances including hood and wine cooler in the kitchen, granite or quartz countertops, custom window treatments and plantation shutters. 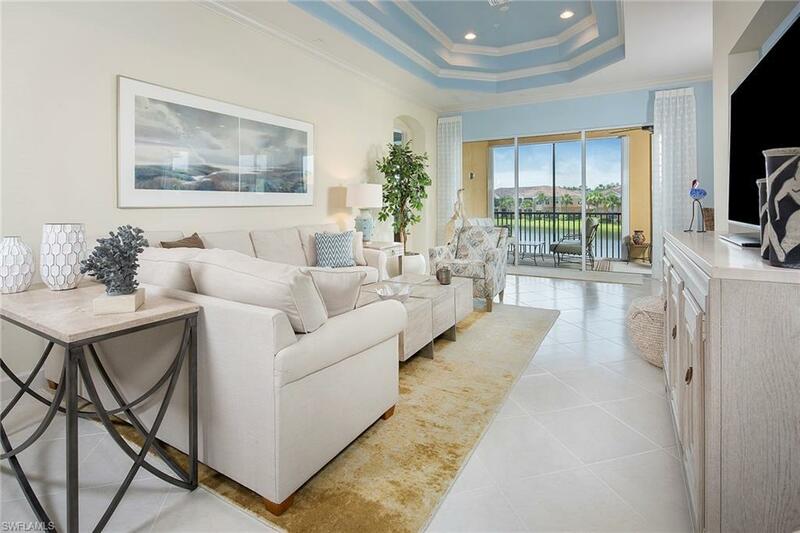 Enjoy serene lake views from your spacious lanai. This home has complete hurricane protection! The Plantation has resort-style amenities, golf, golf clubhouse, large lap pool, resort pool, billiard room, computer room, tennis courts, gathering room, fitness center, bocce ball and an activity director. Close to the shopping, dining, entertainment, airport, and spring training facilities. THIS CONDO SHOWS LIKE A MODEL! CUSTOM DETAIL CARRIED THROUGHOUT AND MR. & MRS. CLEAN LIVE HERE. A TRUE PLEASURE TO PREVIEW!